This nebula lies close by the famous Sharpless object SH2-162 also known as The Bubble Nebula. It is a large nebula that is rather faint over all but picks up well with the hydrogen-alpha filter. If you do not have an H-Alpha filter, you can use a red one as the luminance for the color RGB channels. There is some interesting structure that a larger telescope with a camera that has a large format camera, but you do need to give this object lots of exposure to really bring out the contrast. 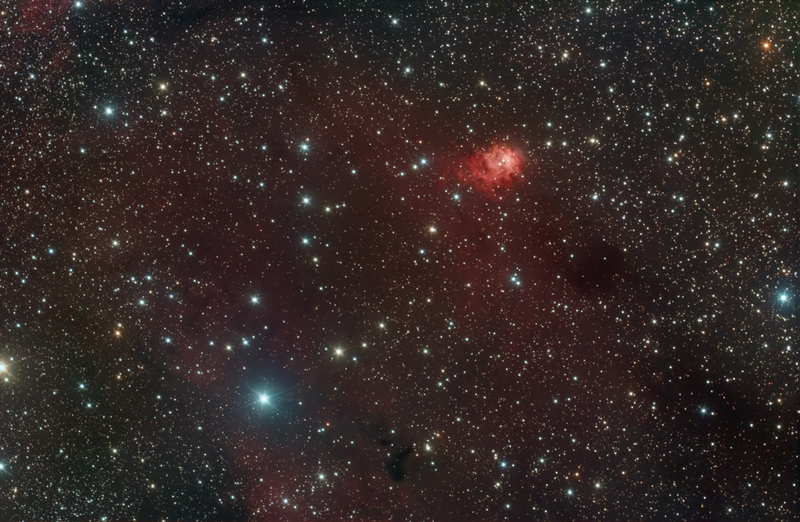 SH2-158 is the very bright nebula that is seen in the upper right corner of the image. As you can see a large telescope can show the fine structure of that little nebula.